As part of the Bangor Science Festival, Bangor University is inviting anyone under the age of 19 to enter their Photography, Art and Poetry Competition. This competition has been established to encourage young people to feel inspired to create powerful and passionate artwork around the themes of wildlife and changes in our climate. The themes of this year’s competition are Patterns in Nature and Climate Change. The competition aims to celebrate the talents of young artists whilst raising awareness of science, the environment and the importance of sustainable living. It will also be an opportunity to highlight the beauty and diversity of Welsh natural history. Stevie Scanlan, Bangor Science Festival organiser, said: “This competition will encourage young artist to explore their local environment and discover the wildlife of Wales, from mountain to coast, river to roadside. By exploring the countryside, discovering wildlife on their doorstep or looking around the school grounds: whether an insect in their garden, a crab on the shore or an artistic interpretation of woodland, they can take their inspiration from nature and the wonderfully varied natural patterns it creates. The winners will be displayed in a special exhibition during British Science Week 2016 (11 – 20 March) at STORIEL the brand new Gwynedd Museum and Art Gallery on Deiniol Road, Bangor. The winners and runner up work will appear on the Bangor University Web site and be used in future Bangor University Marketing for Bangor Science Festival. An awards ceremony and preview of the winning work will be held on Friday 11th March 2016 at 5pm. This competition is open to anyone who will be under the age of 19 on 1 February 2016. Entries will be judged in two age categories – Primary and Secondary. There will be a first and runner-up prize for the best in each age group. Contact telephone number (both daytime and evening). Name of school and class. Title of work and source of inspiration for the entry. The deadline for entries is Friday 27 February 2016. 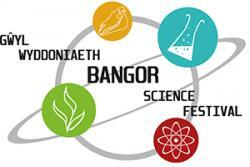 Bangor Science Festival brings you this unique competition as part of British Science Week 2016.